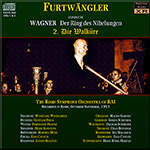 "Until now, the best transfer has been EMI - Pristine’s is in another league"
There are two full recordings of Wagner's Ring cycle conducted by Furtwängler, but neither is the full studio recording planned by EMI to begin in 1954 and left incomplete by the conductor's death at the age of 68 on 30th November of that year. There is a 1950 recording of his La Scala cycle, and this, a series of recordings made for broadcast on Italian radio (RAI) across ten sessions in October and November 1953 in front of a very quiet invited audience. The final broadcasts were cut from both these recordings and taped rehearsal sessions, as chosen by Furtwängler and the RAI engineers the day after recording. The recordings were broadcast a short time after but were not commercially issued until the early 1970s on LP by EMI. Two CD reissues I've examined closely - EMI in 1990 (reissued without apparent alteration in 2011) and Gebhardt in 2005 - managed between them to reduce the quality achieved by those 1972 LPs. EMI's issue has come under criticism for its dull and rather dead sound, whilst the Gebhardt's choice of equalisation is at best unusual, and the sound quality is - according to one's tastes - either improved or severely degraded by the kind of dynamic compression which more usually graces rock music recordings. The latter, which raises the levels of everything by squashing them all into a smaller dynamic space, has the additional side effect of boosting hiss levels throughout. Pristine's 32-bit XR remastering aims to avoid these pitfalls: using predictive, ultra-sensitive re-equalisation to tease out of the recording the precise frequencies expected from Die Walküre in the proportions expected of them, it expands the lower frequencies to provide a fuller and more convincing bass whilst extending the upper treble to produce natural clarity and sparkle, whilst avoiding excessive noise or hiss. Although this recording had a number of shortcomings: a tendency to peak distortion in places; a large number of bass thuds and bumps; these have largely been eradicated or ameliorated, and the result is particularly satisfying and enjoyable - especially if you have the Ambient Stereo version! Hearing this set was like viewing a recently restored painting, having not been aware of the layer of dirt on it until you witnessed the effect of its removal. I have written extensively in Fanfare about the two Ring cycles conducted by Wilhelm Furtwängler, one from La Scala and one from the Italian Radio Studio in Rome. Interested readers are referred to Fanfare 20:2, 29:6, and 33:1 for reviews of both cycles. Suffice it to say here that any serious collector of Wagner cannot afford to be without at least one of these two monumental achievements. There are pluses and minuses to each, but it is possible that Pristine tilts the equation in favor of the RAI cycle because of its remarkable sound. Until now, the best transfer of the RAI Ring has been the EMI set (7 67123 2), and Pristine’s is in another league. (The best transfer of the Scala Ring is Archipel’s, no longer available.) As I have said in the earlier reviews, sound quality is one of the reasons for preferring the RAI cycle. It was produced specifically for broadcast; the performances were unstaged and therefore singers didn’t move on and off mike. In addition, it was broadcast one act per day, with off days between, so the singers (and orchestra musicians) were not exhausted by Wagner’s excessive demands. The RAI cycle is also uncut (Furtwängler makes two cuts in the Scala cycle). Also most of the casting favors the RAI cycle. On the other hand, there is something about the smell of the theater that pervades the Scala performances that cannot be denied. However, we get back to the sound quality. What Pristine has achieved here is close to a miracle. I did a direct A-B comparison with the EMI cycle and was shocked at the improvement Pristine has made. The sound is cleaner, less compressed, fuller at both ends of the frequency spectrum, and overall less “historic” in nature. This comes close to sounding like a 1953 monaural studio recording made under ideal conditions. The orchestra sounds like a real orchestra, and the singers benefit from a far richer timbre than on the EMI set. Hearing this set was like viewing a recently restored painting, having not been aware of the layer of dirt on it until you witnessed the effect of its removal. Perhaps the biggest bonus goes to the Sieglinde and the Brünnhilde—Hilde Konetzni and Martha Mödl. This transfer reveals a bloom on both voices that is not apparent on the EMI set. Mödl in particular is a thrilling Brünnhilde, lacking perhaps the truly glorious instrument of Flagstad in the Scala performances, but willing to throw herself into the role with a passion that was never a part of Flagstad’s arsenal. Serious Wagner collectors will want this set. If you already own the EMI, you may wish to keep it for the booklets (though they do not include libretti), for Pristine’s production is bare-bones, to say the least. But the difference in quality is significant enough that you cannot do without Pristine’s transfer. You can obtain it from their website, pristineclassical.com, as a download or in CD form. I presume that Siegfried and Götterdammerung are coming, and would anticipate them being at the same level. This article originally appeared in Issue 35:1 (Sept/Oct 2011) of Fanfare Magazine.